Perhaps it’s because of the circles we frequent on financial social media, but it seems like there’s been a great deal of debate recently about the prospects for emerging markets (EM). Whether it’s a proposed turnaround in EM’s relative performance versus the developed world, or key chart levels being reached in EM indices and securities, we have seen a bunch of calls arguing for a pending resurgence in emerging markets. We can’t say whether these folks are right or not, but we did highlight a piece of evidence from that latter category above which may bolster the bull case. Every week (usually, but not always, on Wednesday’s), we run a feature on Twitter called #TrendlineWednesday, highlighting some of the most important trendlines across the financial markets. Today’s edition included our Chart Of The Day, showing the iShares MSCI Emerging Markets ETF (ticker, EEM) hitting a potential key line of support. 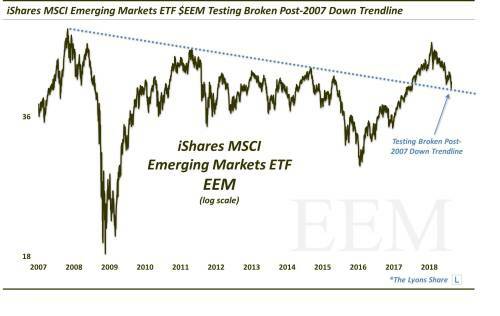 As the chart indicates, the EEM is testing the top of the broken post-2007 Down trendline. That trendline stems from the 2007 all-time high and connects the peaks in 2011, 2014 and briefly 2017. Presently, the trendline is approaching the $41 level. A few days ago, the EEM did kiss the line, putting in a low of 41.13, before bouncing higher for a few days. So is the EM bottom in? – and the long-awaited EM resurgence at hand? In a Premium Post at The Lyons Share, we run down our thoughts on the subject, including our key levels to watch – and perhaps a better indicator to watch for clues to a new EM bull market. If you’re interested in the “all-access” version of our charts and research, please check out our new site, The Lyons Share. You can follow our investment process and posture every day — including insights into what we’re looking to buy and sell and when. FYI, our Pre-FALL Sale (25% OFF) is going on now so it’s a great time to sign up! Thanks for reading! The iShares MSCI Emerging Markets Indx ETF (EEM) closed at $43.37 on Friday, up $0.79 (+1.86%). Year-to-date, EEM has declined -7.96%, versus a 8.17% rise in the benchmark S&P 500 index during the same period.